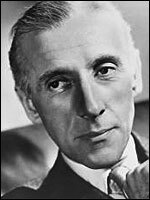 A supremely unctuous character player, adept at smoothly honed sycophancy - as, for example, the literary chairman of The Third Man (d. Carol Reed, 1949), the headmaster in The Browning Version (d. Anthony Asquith, 1951), and one of the wealthy brothers in The Million Pound Note (d. Ronald Neame, 1953). With his plummy tones and sleekly coiffed appearance, he usually played upper-class, but there is a smattering of fake smoothies, like crim Soapie Stevens in Two-Way Stretch (d. Robert Day, 1960), or the merely deferential like the jeweller in Bond Street (d. Gordon Parry, 1948). However, it is hopeless trying to limit the highlights in such a career, which spanned fifty years, every type of British film and not a few international ones, most famously as that arch-gent, Colonel Pickering, in My Fair Lady (US, d. George Cukor, 1964). Marlborough-educated and RADA-trained, he was first on stage in 1922, scoring a major hit as the father of The Reluctant Debutante (1955) and screen since 1936. His son Alex Hyde-White (b.London, 1959) has acted in several films including Biggles (d. John Hough, 1986) and Pretty Woman (US, d. Garry Marshall, 1990).